It's something I can always count on. Something that never leaves my side. Something that I pretty much can't live without. In this case I'm not talking about my boyfriend or my vanilla oatmilk latte. 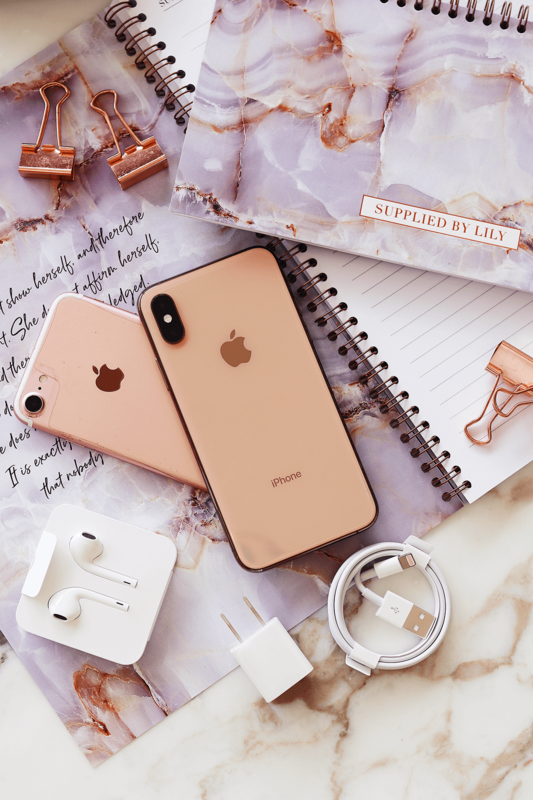 No, today's blogpost is dedicated to my newest tech gadget: the new Apple iPhone XS Gold. After having my trusted iPhone 7 for 2 years, it was time for an upgrade. As someone who is always scrolling on social media, my phone is a very important business tool for me. 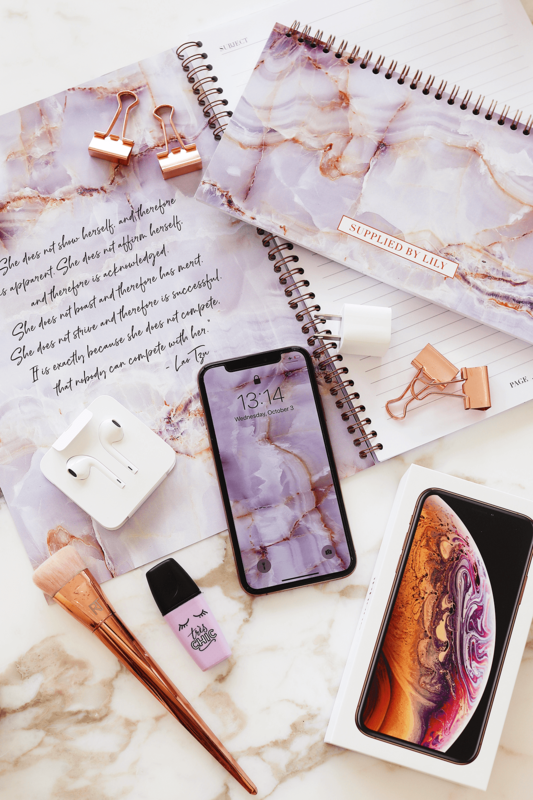 Today I am going to share all the new improvements of Apple's newest phone, as well as putting it to the ultimate test - is this going to be the new blogger or social media influencer essential? Unboxing a new phone is one of the best parts of buying a new phone. 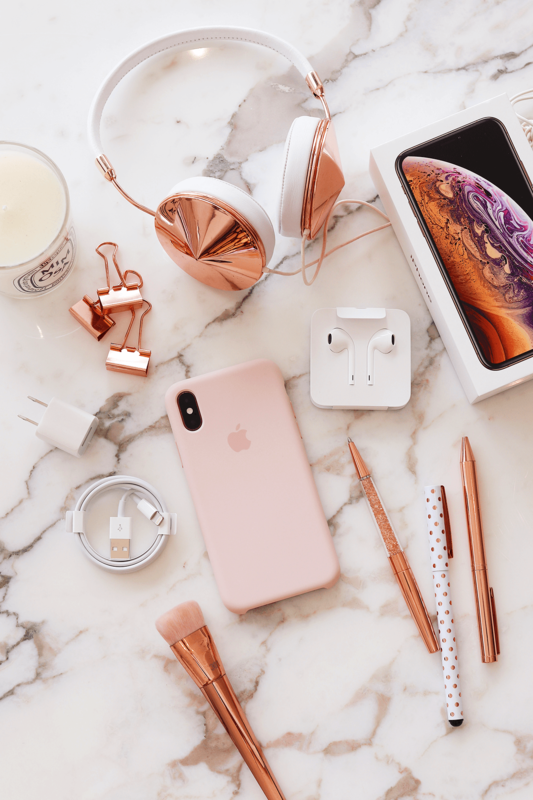 When you purchase the new iPhone XS, the sleek white box comes with a Lightning connector port cable and a adapter to charge your phone, a pin to unlock the sim card holder, and headphones with a lighting ending, since the new iPhone XS doesn't have a headphone jack just like the other newer iPhone generations. I still find this very unpractical since I always forget to charge my phone, which means that it is always close to dying. In addition, I also always like to listen to music. This means that I have to choose between charging my phone or listening to my favorite songs - I can't do it at the same time. Bummer! However, the iPhone XS does allow for wireless charging, which would possibly solve my "I am too lazy to plug my phone into the charger" problem. The iPhone XS comes in 3 different colors (Gold, Space Gray, Silver), and 3 different capacities (64GB, 256GB, 512GB). I went for the iPhone XS Gold 256GB, since I use a lot of memory in order to store all my photos and music. The iPhone has a 5.8 inch Super Retina HD display, which is - literally - a huge difference compared to my previous iPhone 7 with only a 4.7 Retina HD display. Size wise, the iPhone XS is 143.6 x 70.9 x 7.7 mm and weighs 177 grams. Compared to the iPhone 7 that is 138.3 x 67.1 x 7.1 mm and weighs 138 grams, it's definitely a bit bigger and heavier. Other big tech differences that stood out to me is the new A12 bionic chip (compared to the A10 Fusion chip of the iPhone 7), making this phone super fast. I always find it so annoying if I have to wait for my new YouTube video to load, or if my phone can't keep up with my Instagram scrolling. With this new bionic chip in the iPhone XS, I have noticed a huge difference in speed, and I love it. "I always find it so annoying if I have to wait for my new YouTube video to load, or if my phone can't keep up with my Instagram scrolling. With this new bionic chip in the iPhone XS, I have noticed a huge difference in speed, and I love it." Another very big improvement on the iPhone XS is the camera. The back camera has a dual 12MP wide-angle and telephoto cameras (compared to the 12MP camera of the iPhone 7), portrait mode, and video recording capacities of 4K video recording at 24 fps, 30 fps, or 60 fps. The front camera has video capacities of 1080p HD video recording at 30 fps or 60 fps. The iPhone XS definitely upgraded its video capacities compared to the iPhone 7! Aside from the pros, there are also a couple changes that I don't necessarily find improvements. First of all, I am not a big fan of Face ID - I much prefer the older Touch ID that the iPhone 7 used. I feel a bit weird about my phone "seeing" me all the time. Furthermore, Face ID doesn't work well during the night time, so I definitely prefer Touch ID. Second of all, is actually a real deal breaker for me: The angle of the front camera. I like using my iPhone as my vlogging camera from time to time, as well as - obviously - take a lot of selfies and Instagram Stories. However, the angle of the iPhone XS is so narrow - especially when filming - that it's pretty impossible to find a flattering angle for a good picture or vlog snippet. Super, super annoying, and I don't understand why Apple did that. Last but not least, I don't like the fact that the phone is slightly bigger than the iPhone 7. I know this is quite personal, but since I have quite small hands, I don't like having a big phone. The iPhone 7 was perfect to hold in my hands, while the iPhone XS is just slightly too big to fit comfortably. As a fulltime online influencer - or as I like to call it, inspirer - investing in good quality tech such as a camera, computer or editing software is very important. However, I would say that having a good quality phone is just as important. 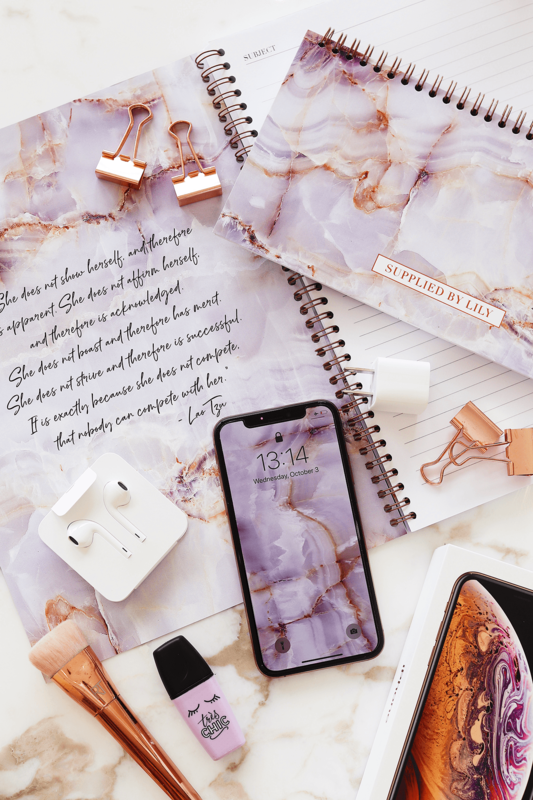 You need to be able to create quality content, anytime, anywhere, especially with social media such as Instagram Stories or Snapchat. A quick snap of you working at a coffee shop, or that cute jacket you spotted at your favorite store - having a good quality phone with you will make this all easier, and prettier. 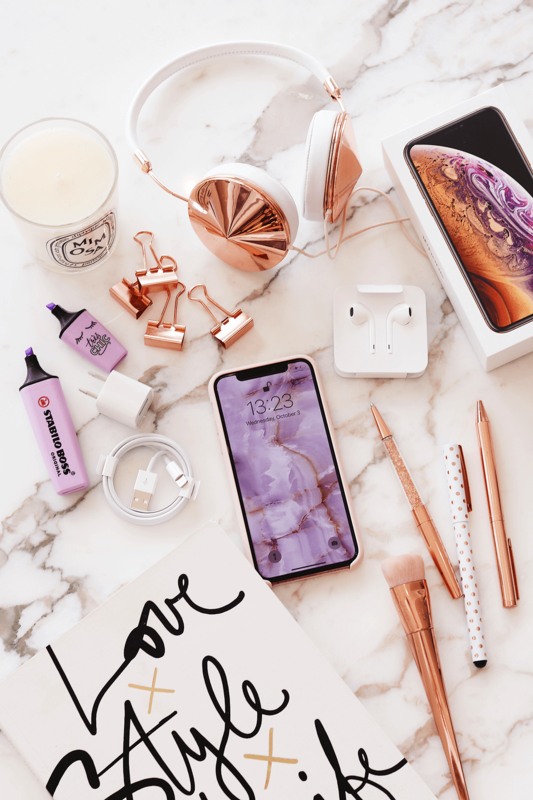 So, is the iPhone XS the ultimate blog & social media essential? I would argue that it is. Not only is the iPhone just really aesthetically pleasing and user friendly, I honestly think that its camera is the best one out there. I know a lot of people will argue that phones such as the new Google Pixel 3 have a better camera, but there is just something about the color science of Apple iPhones that makes me choose them over any other phone camera. The only thing I really don't like is the fact that the front camera has such a narrow angle. You pretty much need to bring a selfie stick with you in order to properly vlog. 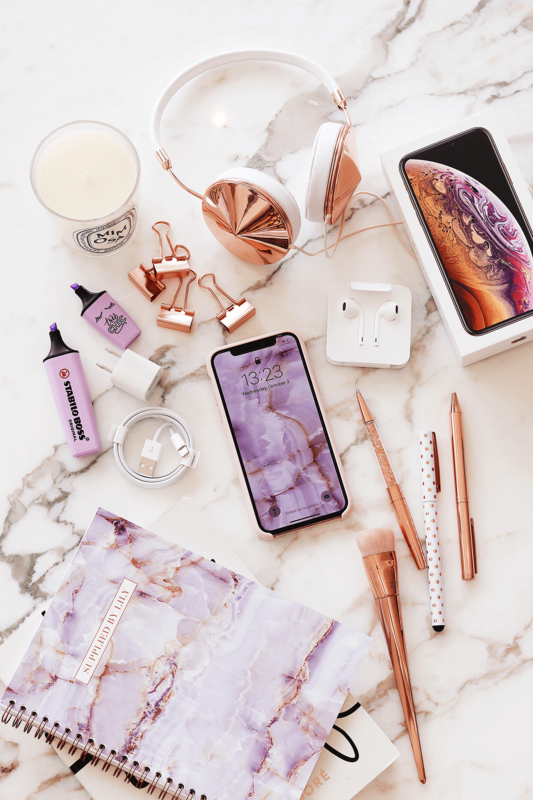 Keeping that in mind, I think that the iPhone XS is a great investment for anyone that is thinking of becoming a blogger or influencer, or wants to take their business to the next level! I saved the most important question for last. Do I think the new Apple iPhone XS is worth it? 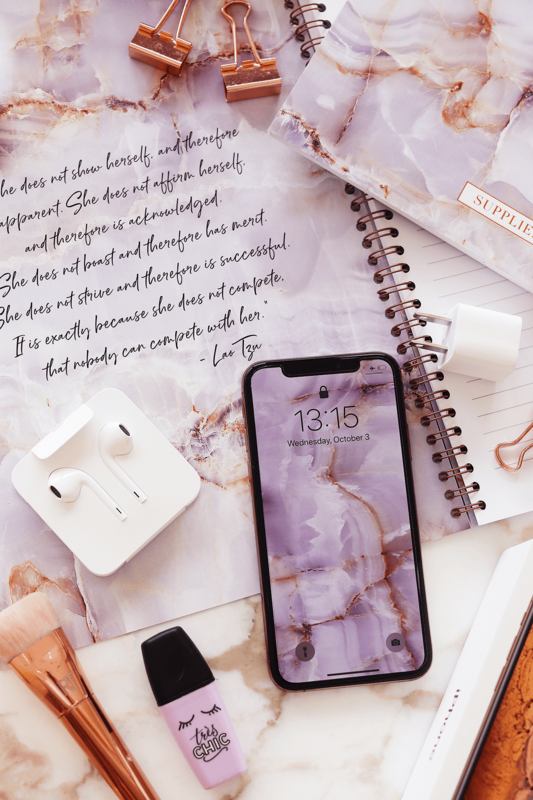 As a fulltime online influencer - or as I like to call it, inspirer - investing in a good quality phone is definitely worth it. With an embarrassing huge amount of time I spend on my phone (at least 2 hours a day), my phone is literally attached to my body, period. And in my opinion, the new Apple iPhone XS is the only phone that I would happily have by my side 24/7. Not only is the new iPhone very fast, has a battery that last more than a day, and has a very impressive photo and 4k video camera with a color science that is in my opinion the best one out there, it is super user friendly and aesthetically pleasing at the same time. I am really happy with my new phone baby and I can't wait to create some beautiful content with it! If you want to see a more detailed overview of all my pros and cons of this phone, check out my newest iPhone XS unboxing and first impression video as well. 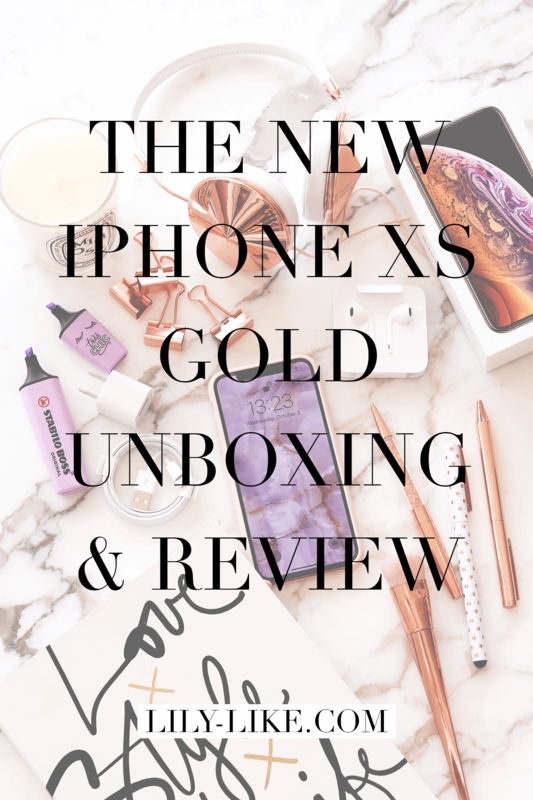 Or if you just love watching unboxing videos like me, definitely check it out! 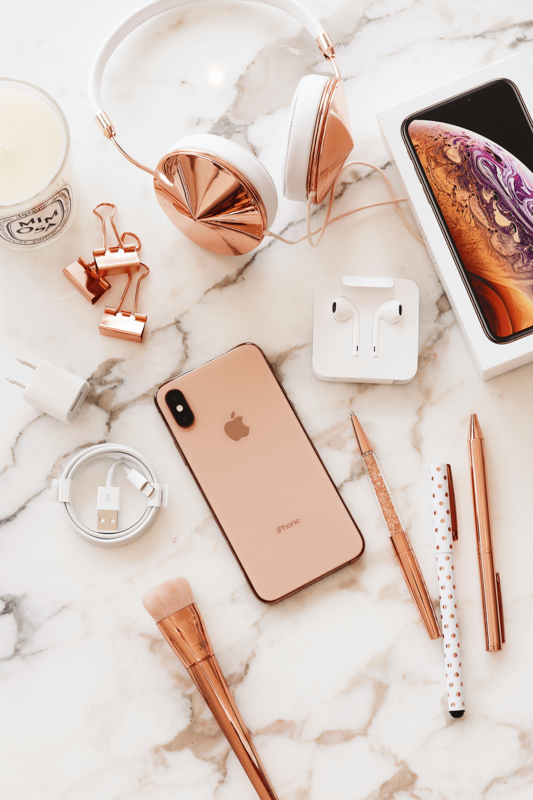 You can find the Apple iPhone XS Gold 256GB here for $1,149.00. Are you planning on getting the iPhone XS? P.S. Wanna see the original post I did on my Apple iPhone 7 when I just got it? Check it out here! Next Post Thank you, next. Seems like a great phone. Anastasia Burmistrova recently posted…Winter fashion trend. Главные тренды верхней одежды зимы 2018-2019. Where is your wallpaper from? I love it! I wish I could also buy IPHONE XS GOLD but want to ask that in which color it look most beautiful? I hope in a few months by saving money I might buy it.